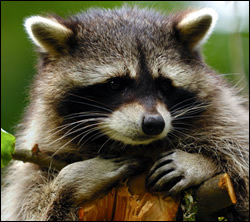 Florida raccoon removal can help you with any type of raccoon problems that you may have. Raccoons might look endearing; however when raccoons are digging in your garbage are not so pleasant. Raccoons really love to explore your trash can attempting to find food. Raccoons are nocturnal animals which will damage lawn as they dig for grubs and worms. Raccoons will make dens in your attic. They will tear into your rooftop as the search out ways in. The smell of raccoon urine and droppings can be very strong. Florida raccoon removal will help you with this pest animal. A number of the areas that raccoons like to build nests are chimneys, crawlspaces, and attics. Call us to assist you with raccoon trapping, exclusion and raccoon clean up. Florida wildlife removal can help you with problems of raccoons in the attic. Raccoons can be a pest animal that will cause a great deal of damage to your home. If they get into your attic they can tear up the insulation or damage your sheetrock. They often come into your home looking to build a nest for their young. We can help you to remove raccoons from your attic and provide exclusion to keep them from getting back in. Once the raccoons have been removed from the attic there is still the problem of the damage that they may have caused. Raccoons can stain the insulation and wood in your attic with their feces and urine. We can help you with cleanup and deodorization services. We can also help with insulation removal and replacement. Raccoons can cause a great deal of damage to your roof as they are trying to find entrance to your home. They will tear up the shingles and rip into the wood. Not only do you end up with raccoons in your attic, but you have the potential of water damage from the holes that they have created. We can trap the raccoons and help you to fix your roofing. We can put caps on the chimney to prevent them from entering. We can also repair any damage to siding or vents that may have been torn up from the raccoons trying to get into your home. Raccoons in your yard can be a problem. Raccoons are clever animals and they will find ways to get into your trash looking for food. Raccoons will also dig up your yard or garden in search of insects. Raccoons are a nocturnal animal; so if you hear an animal in your trash at night it could possibly be a raccoons. We will help you to locate and trap the raccoons. We will trap and remove the raccoons from your property. Raccoons also carry disease that can be spread to you, your family, or your pets. Don’t let this pest animal live in your yard. Call us today to help you remove raccoons from your home.